Emails are a part of our daily lives, well, most of our daily lives. Businessmen, bloggers, writers and people who live on the internet use emails to send messages, information, small files etc. An email is a more professional way to talk to clients, instead of talking over the phone or sending text messages. I have been a Gmail fan from long and have been using many other Google services. One feature which I always missed in my fav. Email service is “Gmail schedule Email delivery“. This one feature, will take care of many worries, specially bloggers like me, who have to schedule Emails for so many occasions or even for normal day to day life usage. Anyways, though we don’t have Email scheduling as default feature, but there are many 3rd party tools like Boomerrang which let us schedule Email in Gmail. All the web apps mentioend below offers plugins/extension to offer this feature. My first preference is always Chrome as a browser, but I’m adding links to all browser addons. Use it wisely and now don’t miss out your deadlines. Scheduling emails can be very useful at times. Suppose you want to send a mail to someone, but want to add some details before it goes out. You can schedule and email and add the required info before it is delivered. That way, you can always edit the email and add something extra or remove something and send it. At times, you’re not sure about whether you want to send an email or not, well, you can schedule it delete it if you change your mind. 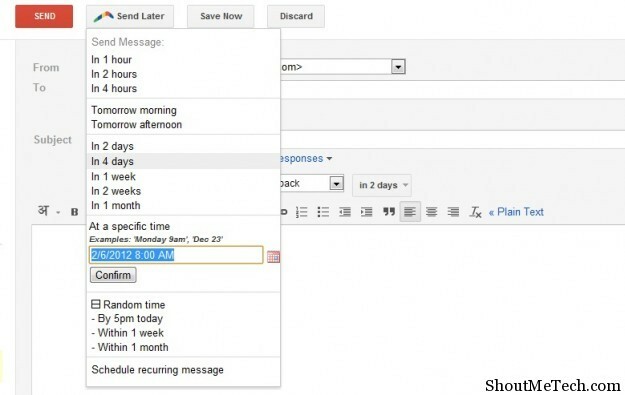 Today, I’ll be talking about 2 such easy methods that can be used to schedule email in Gmail. These methods involve the use of certain extensions for Google chrome and Firefox. Alright then! Below are two extensions, both for Google Chrome and Mozilla Firefox, that will make the task of scheduling emails super easy for you. The option to do so will be integrated right in to Gmail with these extensions. Right Inbox is currently in beta, but it is good enough for daily use. Just install the extension or addon for Chrome and Firefox respectively and you’re ready to go. 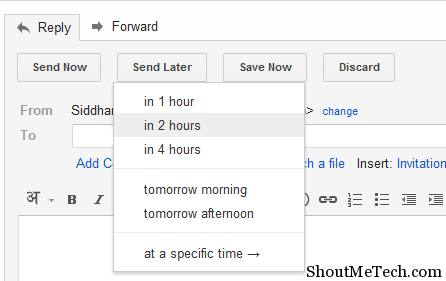 As you can see in the screenshot above, a new “Send Later” button appears in Gmail, wherein you can select the time your email should be delivered. There are preset time intervals like 1 hour, 2 hours etc, but you can also add your own specific time. There you go! 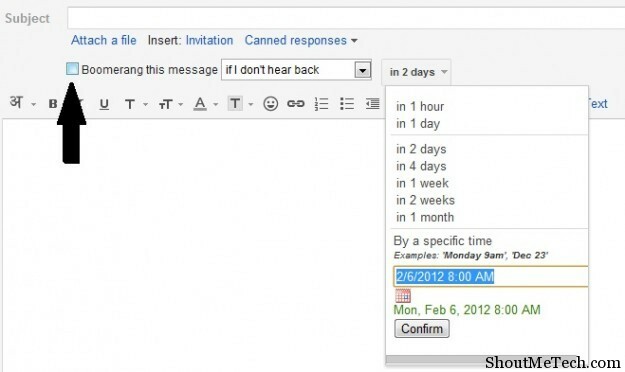 You can now schedule emails directly from withing Gmail. RightInbox doesn’t store the body of your email, so, if you’re worried about the company getting access to your emails, don’t be! Boomerang does the same exact thing as RightInbox, but it does it better, gives more options and can do more than just scheduling emails. There are two features that this amazing extension has. Firstly, you can schedule an email based on certain predefined times or a time of your own, as you can see above. Secondly, if, after sending the email, there is no response from the recipient, then you’ll get the email returned to your inbox. This feature is called Boomerang this message and yes it works. The extension works without any problems, but again, you’ll have to give Boomerang servers your email access. Some people may not like that! The company has given their word that they don’t look at your emails, but only the headers. Try it out using the download link below. Download Boomerang for Chrome, Firefox and Safari here. Complete instruction to set up Boomerang can also be found at above link, which is not technical at all. Boomerang Pro offers some additional features and removes the limit of 10 Email/month. Their basic package starts from $4.99/month. For marketer, this service is very useful as they offer response tracking and also offer feature to send reminder for un-replied Emails. More advanced version offers click tracking along with Salesforce integration. Probably, a person like you and me would be happy with free subscription for now, but if you have used their pro feature, do let me know how was your experience. That’s the two easiest ways to schedule your emails on Gmail and also get reminders for undelivered, returned emails. The seamless integration of both of these services in to Gmail, is one of the best things about them. You don’t feel like it’s anything extra! It does, however, seem like the days of the email is coming to an end. As more and more users on the internet prefer Facebook messages or Skype now, the number of emails are, no doubt, decreasing. Although, according to me, the email will never actually die. Professionals will always stick to emails as it, without any doubt, is much better than any other service. So, did you use any of the above extensions to schedule email in Gmail? How’d that work out for you? Give us your opinion.